Music by Robert W. Smith, arranged by John Meehan. Highland is a community that sits just outside the Metro East area of St Louis along Interstate 70. Highland High School has 987 students in the high school. 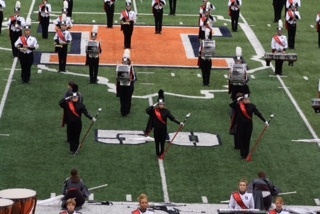 The band program has had a tradition of excellence that extends for many years including an invitation to perform at the Superstate Band Festival in 2002 on the campus of the University of Illinois, placing first in our class at the 2010 ISU Concert Band Festival, and most recently placing third in our class the 2011 University of Illinois Marching Festival. Currently there are about 110 members in the HHS band program. Components of the band program include: Marching Band, Concert and Symphonic Band, Jazz Band, and Pep Band.